(Nanowerk News) Molecular physicists from Radboud University Nijmegen have produced images of the changes in direction of colliding nitrogen monoxide molecules (NO) with unprecedented sharpness. By combining a Stark decelerator with advanced imaging techniques, they were able to obtain very high resolution images of the collision processes. The results were published in Nature Chemistry on 9 February ("State-resolved diffraction oscillations imaged for inelastic collisions of NO radicals with He, Ne and Ar"). The project supervisor, Bas van de Meerakker, was also the first to achieve controlled collisions between two molecules and produced images of collision resonances during his stay as visiting professor in Bordeaux. While carrying out this research, Van de Meerakker and his colleagues detected diffraction oscillations – fluctuations in the angular distribution of the molecules – following a collision. 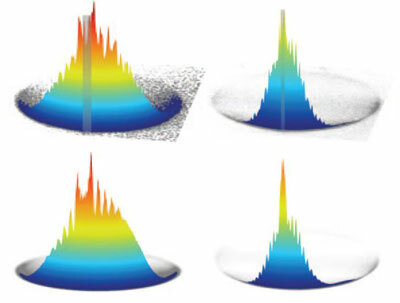 These diffraction oscillations provide a unique image of the collision process. ‘The changes in direction and, in particular, the oscillation structure that we observed, have long been predicted in theory. Even though we had hoped to be able to visualise this theory in high resolution using our decelerator, the fact that we actually achieved it is really quite something,’ said Van de Meerakker (see Figure 1). The publication of their article in Nature Chemistry means that the molecular physicists are yet another step closer to the ultimate molecular collision experiment, in which all variables are controlled. Van de Meerakker’s next step will therefore be to use not one but two Stark decelerators to control both beams of colliding molecules. The expertise for this research project came from three different departments within the Institute for Molecules and Materials (IMM) at Radboud University Nijmegen. The quantum mechanics theory came from the group run by Gerrit Groenenboom, Professor of Theoretical Chemistry. The velocity map imaging technique was developed by David Parker, Professor of Experimental Physics. The expertise relating to operation of the decelerator came from Van de Meerakker’s Cold and Controlled Collisions Group.